Approximately 500 questionnaires have been returned. 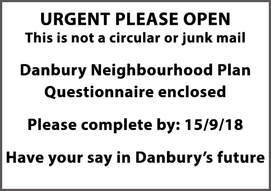 Whilst promising, we need the views of many, many more residents, so please remind your friends and neighbours to complete the Questionnaire. If you need another paper copy, please either print it yourself using the following link PAPER QUESTIONAIRE or telephone 01245 225111. The questionnaire was delivered by hand to every house in Danbury in an envelope like this. ​Please look out for it. If you have not received your copy, please contact Lesley Mitchelmore 01245 225111. Your feedback is essential - without it we cannot complete the Plan. All Questionnaires must be completed by Saturday 15th September 2018. All Danbury residents and business owners can complete the questionnaire using either the paper copy or an electronic version online available. Please use the electronic version if possible as this will reduce our costs. Click ONLINE QUESTIONNAIRE to access the online version. There are 4 unique numbers listed in the covering letter with the questionnaire. You will need to enter one of these when you start the questionnaire (both paper or on-line versions). ​​Other members of the household who want to complete the questionnaire must use one of the remaining numbers. Each number can only be used once. A copy of the questionnaire to print can be downloaded by clicking PAPER QUESTIONAIRE. ​If there are more than 4 members of the household or if you have any queries, please contact Lesley Mitchelmore, email LesleyMitchelmore@danbury-essex.gov.uk or phone 01245 225111. If you have completed the paper version, please return it to us using the pre-paid envelope. The emerging Chelmsford Local Plan has allocated 100 homes to be accommodated within or adjoining Danbury’s Defined Settlement Boundary. Landowners and developers have put forward 20 sites to build these homes. The Questionnaire includes a series of questions to allow residents to express their views on how suitable they consider each site / location to be for development. Planning applications on some of the sites have already been submitted to Chelmsford City Council. Development options have been prepared for other sites, but for some sites no proposals have been identified at all. This stage of the process is a fact-finding exercise, to provide us with a detailed picture of the views of residents. We are not considering any proposals put forward by landowners or developers. ​The next stage of the site selection process will be to consult with landowners and developers reporting the wishes of the residents and to determine what housing they are able/willing to provide. At the Exhibition in March, a map of the submitted sites was displayed. Since then, 2 further sites have been submitted. The revised map can be seen at SITE MAP. ​The two new sites are references D20 and D21. The area of each site is not to scale and is for illustrative purposes only. At the Exhibition, residents suggested a number of views of Danbury that may be protected. We have added viewpoints to the Footpath map of Danbury identifying these views with the reference in the questionnaire. ​You can access the Viewpoints ​Map HERE.